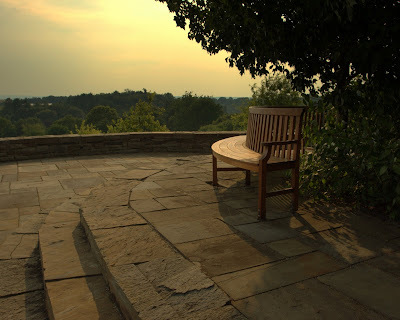 This weeks Bench of the Week for me is a circular bench that overlooks the Cornell University Plantations. It's a great spot. There are two of these benches on this overlook that are a 1/3 of a circle. Between the two benches is a long gong with a hammer. It's a very peaceful place, with great stone. I hope you enjoy. It's been a while since I've posted to this blog. My Photo of the Day Blog has taken over for this blog. I already had a photo of the day. My rules prohibit me from posting two photos of the day on that blog. Photo details: Exposure time 1/320 sec, Aperture f/5.6, ISO 100, Focal Length 17 mm, 35 mm equivalent focal length 27mm, Lens Canon EF 17-40mm, circular polarized filter, tripod. Your circular bench is gorgeous! I also like the stone work beheath it! I bet its a beautiful place to sit for a spell. I see this is your third bench and I missed the other two so ging to search for them now. Drop by and see my special benches on Mt. Rainier. That must be a wonderful place to sit and watch the scenery and ponder on life, the universe and everything. Making the curved like that was just right - and I enjoyed the photo as such as well. What a wonderful place to sit to admire the view, basking in the glow of the sun. My bench is a wee bit 'late' today.